I have wanted to make these cupcakes since the first time I came across this recipe. The flavors are based on a popular bar drink known as the “Irish Car Bomb” in which a shot of whiskey and Bailey’s Irish cream is dropped into a half filled pint glass of Guinness and you have to down it before the whole thing foams out over the glass. That doesn’t sound like my kind of thing, but cupcakes I can do! These cupcakes originally caught my eye because Chris’ favorite beer to drink is Guinness. I absolutely love cupcakes and I really don’t need much of an excuse to make them, especially ones with chocolate! We had one of our closest friends over for dinner the other night so I decided I would try them out on her while she was here. We all loved them very much. The cake is super moist and has the perfect chocolate flavor. The Bailey’s chocolate ganache in the center is the absolute best part of the cupcake (I couldn’t stop eating it out of the bowl when I made it), it is a very delicious surprise when you bite into the center of the cupcake. 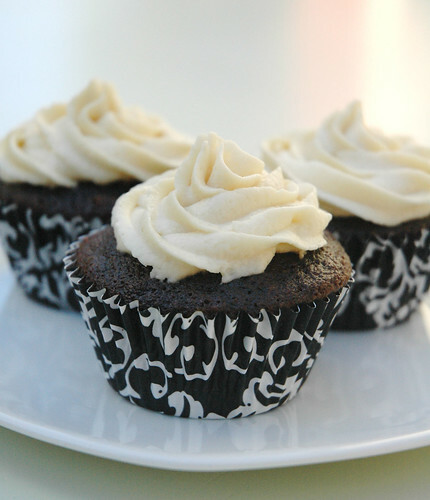 The Baileys adds a lovely flavor to both the frosting and the ganache, it isn’t too overwhelming at all. These are definitely adults only cupcakes, but I highly recommend them for your next adult get together.